Where did the animals go? The animals are attached by a stretchy band that softly snaps back when pulled. Included are rustling foil and a squeaker. Washable, air dry. I purchased this toy for my 5 month old because it resembled a toy I had when I was a baby. I love the “orange-shaped” sections and the little animals and figures that hide within. I was hoping this toy would be easier to grasp, as my little guy is still working on his grasping skills. I think he will love it in about a month, when he is able to sit up fully. It is fully washable, just air dry and it looks great. I am disappointed that Haba’s plush toys are made in China. The quality of the toy looks and feels good, I would just feel better about it being a German-made toy like their wooden line of baby toys. We own quite a few Haba toys and my son plays with them all. I bought this after reading reviews on another website. We received it the other day and it doesn’t not disappoint. Perfect size for baby/toddler play. Like the other reviewer mentioned I couldn’t exactly tell what one of the animals were but it doesn’t take away from the toy. My toddler actually enjoys this more than the baby lol she likes to pull the different peek a boo shapes out. It’s well constructed and made to last. Another well loved favorite. 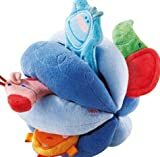 My son loves pulling the colorful animals and crinkling them from this peekaball. It’s soft, light weight and easy to grip all over.